Hi there. It’s me. The unofficial-official expert on everything Swig cookie. If you doubt this statement, read my original post and recipe development epistle on Swig Cookies here. Now that we have our very own (truly official) Swig shop in B-town, and don’t have to drive to St. George to get a fix, the hype has come to Davis County, Utah. If you aren’t a Utah resident, or don’t regularly drive through our state, you may be wondering – What’s a Swig cookie? Refer back to the original post. Also, if you can’t get to Swig, or just want to make your own at home, you’ve come to the right place. The cookies at the B-town Swig shop are better than the Swig Cookies in St. George. Anyone else want to bear testimony of this? If you’re a chocolate or lemon-lime lover, check out my chocolate“Swagg Cookie”recipe and the spring-time favorite, the“Sprig Cookie”. Take butter out of refrigerator and microwave for about 15 seconds. Place butter, shortening and cold sour cream in a mixing bowl. Mix for about one minute. Add sugar and almond extract, mix until smooth. Mix just until flour disappears and the mixture comes together in a ball of dough, about 1 minute on very low speed. Spray the cookie scoop with a little cooking spray. Scoop the dough onto a lightly greased cookie sheet. I use a 2 inch scoop. A 2 inch scoop will produce a cookie similar in size to the Swig cookie. If you don't have a cookie scoop, use an ice cream scoop or roll the dough into a ball about the size of a golf ball. It is best to use a scoop and overfill it a bit to get the desired jagged edge. Spray the bottom of a flat glass with cooking spray. Flatten one cookie a bit then dip the glass in sugar. Press the bottom of the glass against the cookie. Press the cookies so they are flattened a bit ( until the cookie dough just reaches the outside of the edge of the glass) twisting the glass as you press to produce a jagged edge. I bake 8 cookies per tray. Continue until all cookies are flattened. Tips and (surprise) a few more comments-The recipe looks a little long and maybe even complicated, but it's not. Once you get the hang of the technique for scooping and pressing, it takes less than a half hour to make and bake the entire batch.-If you want the cookies to taste more like the original Swig cookies make this adjustment to the dough: Omit the almond extract and reduce the sugar to a total of 3/4- 1 cup.I prefer the cookies to be sweeter, so I like 1 1/2 cups of sugar in the dough. 1 1/2 cups of sugar may sound like a lot, but consider traditional chocolate chip cookies have 1 1/2 to 2 cups of sugar to 2 1/4 cups of flour. The ratio here is 1 1/2 cups sugar to 4 1/2 cups flour.-This cookie measures about 3 3/4 to 4 inches across when finished baking.-The St. George Swig cookie is frosted with quite a thin layer of frosting. I prefer my frosting to be a bit thicker. If you want to frost the cookie with a thinner frosting, add about 3-4 tablespoons of milk to the frosting.-This cookie stays quite well in the fridge for about a week if kept in an air tight container. I frost the cooled cookies, then store them in the fridge. Once the frosting is set on the cookie, you may layer the cookies between sheets of parchment or wax paper. This allows you to stack the cookies without taking up too much space in the refrigerator.-This cookie freezes well frosted or unfrosted.-If you are making this for a gathering where there will be other desserts, use a smaller cookie scoop and bake for less time.-The photo directly above recipe shows two batches of frosting. One with one drop of red food coloring, the other with two drops. These look wonderful, heading to St. George in July will have to check them out. These cookies are SOOOOO awesome and exactly like, if not better, than the ones at Swig. My favorite though is your Sprig adaptation! I love anything citrus. Thanks Carolyn. I agree, the Sprig is always a favorite in my kitchen! I remember these fondly from Alt Summit – best "business card" ever! I agree with what you said on Studio 5 today about the cookie not having any flavor. I LOVE SUGAR COOKIES and after hearing so much good about the cookies – I got one in St. George – and after having a couple of bites – I decided that it was a flavorless – dry cookie that didn't warrant the calories. But I LOVED THE FROSTING!! So – I just licked it off 🙂 You said that the Bountiful swig's cookies were made at a bakery in Provo. Do you know which one? Provo Bakery? Shirley's? Isn't there a swig in Provo too? No mention of the bakery, but it could be a commercial or retail bakery there? Interestingly, last night my daughter bought a few sugar cookies at the Bountiful location, and they taste like the St George cookies. Hmmm. Not sure why. I hope they did not change their supplier or the recipe they were using. If so, I'll just go back to buying the flavored soda and make the cookies at home! I noticed the recipe on this page and the original page (even with the changes in red) are different. Which one is correct? We are REALLY excited to try these since my daughter is allergic to eggs. Thanks a bunch for the recipe. The original recipe is half of this recipe. When I decided to re-post this, I went ahead with the double version, since that is the amount I always make. When I posted the smaller version, I was testing the recipe and tried to make it in the smallest quantity possible because it was not yet perfected. I'd go with this latest version. I'm so glad you are able to give these to your daughter! Several years ago, one of my kids could not eat sugar for a period of time, so I know how difficult it can be to find recipes that work when you have food allergies, sensitivities, etc. Let us know how it works for you! I was in St. George a few weeks ago and we made a few stops at Dutchman's for cookies and brownies. We have been going there for years and just love it. I asked if they still bake cookies for Swig and they said they don't anymore. I asked if Swig uses their recipe and the checker wasn't sure, but she said that they had somehow ended up with Dutchman's brownie recipe. So I'm wondering who bakes for Swig now in St. George and in Bountiful? I love Dutchman's and love that they have made such a name for themselves by selling cookies in a gas station made from the owner's Grandma's secret recipe. I want to try your version! When I did the original recipe back in 2013, I was told and found online that Swig had their cookies baked by Diutchman's in Santa Clara. After I posted that recipe I heard that about the same time, Dutchman's and Swig parted ways. Apparently, now Swig in St George has their own baker. They tried to duplicate Dutchman's recipe and were a little off the mark. I'm headed to St George in a few weeks and Im going to try to make a pit stop at Dutchman's and see for myself. The Bountiful location and the Lehi locations use a baker in Provo. I talked to a person who works for Swig and that's what they told me. The said there are actually two bakeries used in Provo. Give this version a try. I still tinker with it from time to time, but all of my taste testers love this version. Have a great day Jamie, and thanks for your update! Dutchman's ARE the best!!! Can't wait to try this recipe too. I'm kind of disappointed that swig tried to copy cat the Dutchmans recipe. It's all because of Dutchmans that swigs cookies got such a great name. There new recipe is definitely not even close to the same! Dutchmans also supplies fabulous Freddy's. When I'm craving a taste of home I head down to the F.F. On 90th and get a Dutchmans cookie. I've heard great things about this recipe and can't wait to try it!!! I second that testimony of Bountiful cookies being WAY better. Wouldn't have tried one if you hadn't shown up on my doorstep with one in hand insisting (so hard for me to do) to try it out. Making these today, the sprig are so so heavenly but I don't have the citrus on hand so I will settle for the delicious original. Bearing testimony of the Btown Swig cookie. You're my favorite. I love Swig, and I think the sugar cookies are great, but for me it's more the experience than the cookie. I love that they're cold and they taste great with the sodas. Really I prefer your pan sugar cookies any day. YES! Baking these will save me SO much money! I swear I'm there five times a week! Thank you so much! You and me both! I'm addicted to the Bountiful addition. Although lately, their bakery is cooking them a little on the doughy side, so I'm not a fan of a doughy sugar cookie. It's always best at home! Have a great day Heather! What are you trying to do to me? 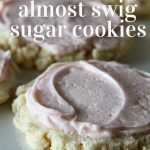 Keep posting these delicious swig cookie recipes. I did the Sprig Cookies a few weeks ago and I think I ate most of the batch myself, they were so amazing! Now I will try to make the original recipe. Maybe for Memorial Day so I can have more help eating them. If you haven't tried the original, I'm guessing you'll get hooked! Thanks for leaving me a note, happy baking Amy! Saw you on studio 5 and made the cookies. They were so good. My family loved them!!! Thanks so much for figuring out and sharing the recipe. Thank you Kathy! So glad your family loved the cookies. Happy baking! Oh! This is dangerous information for me to have! I have made your Swag cookies and last night, I made your original Swig cookie. I'm in LOVE! I don't have a 2" cookie scoop, mine is a little smaller 1 3/4". I cooked them for about 12-13 minutes in a regular bake oven. I'm thinking I should decrease the time a little. They seemed a little dry. Do you think switching Almond for the Vanilla in the frosting would be too much Almond? I turn to your blog almost everyday to figure out dinner! You're the best. I also found your daughter's blog, Mint Arrow from one of your posts about 6 months ago. Corrine is not only beautiful on the outside, but on the inside as well! So sad she moved to California! My friend lived in her ward, and suggested I have her come talk to my Young Women. Dang! I bet you're missing her and her adorable Ani! If the cookies seemed a little dry, I would definitely decrease the cooking time. I like almond in the dough and vanilla in the frosting, but I know people who prefer almond in both, so give it a try! I am glad you use ABK for meal planning. So nice to hear you are putting the recipes here to good use. We do miss Corrine and are glad they are not too far away! She is very special person, thanks so much! Do these freeze well after they are baked (before frosting)? I would love to give them as friends presents, but get them done earlier than I need them. Challey, Sorry I missed your comment earlier. By now, you probably know these cookies freeze well. I bake the cookies, let them cool, frost and refrigerate. When they are set, I place them in the freezer in pans, separate the layers with wax or parchment paper and cover tightly. The cookies will stay good for at least a month. Perfect! I love how your version uses shortening instead of oil. Those chocolate pobres look great too. Will be making your Almost Swig Cookies. How many large cookies are in a batch? Thank you! Usually about 18-24 depending on the size of scoop you use. Thanks for reading ABK! The Provo Swig cookies are having the same problem! Often they'll be frozen. We've stopped buying them, and make yours instead. I just made these with coconut oil instead of shortening since I didn’t have it. I don’t know what the difference would be as I haven’t made it with shortening, but they are amazing! I had my first swig cookie down in St. George over Thanksgiving. I drove down from Oakland, CA to meet my family, and of course heard about the cookies–hadn’t ever heard of them before. I only had one, and found myself craving them back in California. Thanks for the recipe! Thanks SaraJane! Im going to have to try coconut oil. Ive been experimenting with it lately and love the results too! I am not familiar with baking with shortening. Are you saying that you can substitute canola oil for shortening? Sorry I am responding so late to this comment! Yes you may use canola oil in place of the shortening in this recipe. Happy baking! I don’t usually ever leave comments, but I just got done frosting the last cookie and ARE YOU KIDDING ME??? 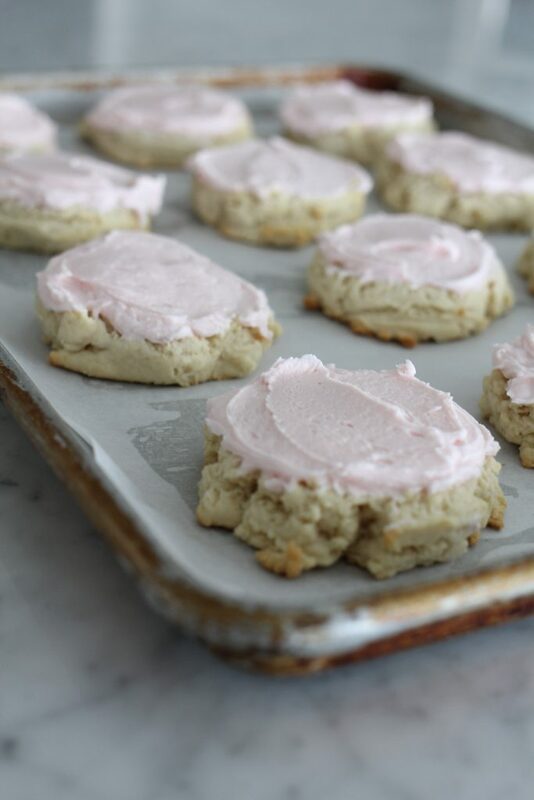 Easiest sugar cookie and SO good! Better than Swig and another drink shop that is near by. Thank you for sharing your talents with us! Thank you! They are so simple and they freeze and stay fresh if kept in the fridge as well. That is if you can hide them 😉 well enough. thanks for reading ABK! The provo cookies taste weird now too 🙁 I buy oatmeal chocolate chip and peanut butter cookies at sodalicious instead! Best swig cookies I’ve ever had! Thank you so much for posting and perfecting this recipe! So excited to try the recipes. I read recripe books like novels. I’m making swig cookies tomorrow. Can’t wait!! You’ll love these! Thanks for reading ABK! I’m making these today. Do you use salted or unsalted butter? Madison, Sorry I missed your comment, I use unsalted butter, but salted will work as well, just reduce the amount of salt in the recipe. Do you think I can just bake it all in one sheet pan for a bar cookie? Hi Jennifer. Sorry I occasionally miss questions! I have never tried baking this recipe all in one pan? 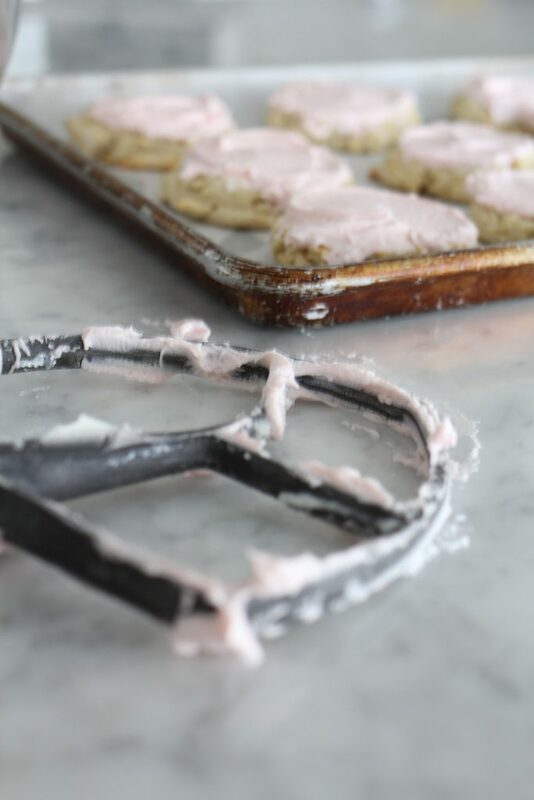 If you are looking for tried and true pan sugar cookie, try my Sour Cream Sheet Pan Cookies or the Pan Cream Cheese Sugar Cookies on this blog. Both are excellent! Hi! If using canola oil instead of shortening, is there a measurement difference? Or does it translate straight across? Also, does it change the texture at all? I’m sorry if this has been asked previously, I didn’t have a chance to read through all the other comments! Thanks!! Hi! If using canola oil instead of shortening, is there a measurement difference? Or does it translate straight across? Also, does it change the texture at all? I’m sorry if this has been asked before, I didn’t have a chance to read through all the other comments. Thanks!! Hi Adrian, yes the measurement is straight across. I believe using oil instead of shortening makes the texture a bit more tender or soft, which I prefer. My favorite combo lately is half butter and half oil. Hope you love this recipe! I made these for the first time recently, and they turned out amazing! I only had enough sour cream for the frosting at the time, so for the cookie dough I made a substitute for the sour cream: in a 1-cup measuring cup I added 2 Tbs of vinegar then filled the cup with heavy cream. It worked perfectly! So delicious. Thank you! Love that you found a substitution that worked for you. These cookies continue to be hugely popular to this day! I have been wanting to make this for nearly a year and kept putting it off because it always seemed a bit complicated and time consuming. But you’re right, they were pretty darn easy. Your recipe is basically fool proof. They turned out much better than the sugar cookie that I pay $2 for at our local soda place. Thanks so much for creating /sharing this recipe!!! I will be making these frequently. Thank you for your positive comments! This recipe is a favorite. Now that you’ve made them once, making these cookies will only get easier! What are you going to do with all that money you are saving on cookies?? Are we able to roll these cookies and cut them out? I want the fun Christmas shapes but I LOVE these cookies. The beauty of the Swig cookie is that it’s beautiful and delicious without rolling and cutting. If you would like perfect dough for rolling and cutting, try Our Favorite Sugar Cookies or Cutler’s Famous Sugar Cookies. Either recipe should work well for you. Hello! Just wondering if you can roll this dough out and use a cookie cutter? Hi Micki, you can roll the dough out and use a cookie cutter. I prefer to use a cookie scoop or roll it into a ball and then flatten them with the sugar coated glass. This makes it look and have a similar texture to the actual “Swig” cookie. Thanks for asking and for reading ABK! I made these for a baby shower today and nobody believed they weren’t Swig cookies. I think they are much better than Swig. I love the addition of almond extract. Thanks again for another great recipe. Thanks so much Whitney! They are the perfect cookies for a baby or wedding shower. We make them often for those occasions! Such a great cookie for make ahead as well.